3/4 tablespoon fresh lemon juice. Mix together flour, salt, oats, brown sugar and cinnamon. Pour in butter and stir until mixture is crumbly. Set aside. Combine sugar, cornstarch and water in a saucepan. Stir well, then turn heat to medium and bring to a boil. Cook for 1 minute, stirring often, until thickened. Have apples and cranberries ready in a bowl. Remove from heat. Pour sugar mixture over apples and cranberries and stir well to coat. Stir in vanilla extract and lemon juice. 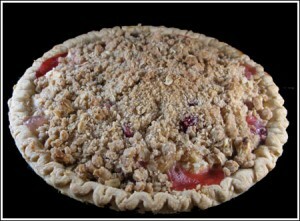 Pour apple mixture into prepared pie crust and sprinkle crumbly mixture over top. Bake at 350 degrees for 45 minutes or until top is brown.